Contrary to chemistry’s usual individualism, where molecules react one by one, US researchers have forced a gas into a strangely unified condition where its components can’t be distinguished. ‘Every molecule, in some sense, knows where the others are,’ explains Luigi De Marco from JILA, a joint institute of University of Colorado, Boulder, and the US National Institute of Standards and Technology. The JILA team, led by Jun Ye, created the first ‘quantum degenerate’ molecules by mixing potassium and rubidium gases at 50nK. At this temperature, just 50 billionths of a degree Kelvin above absolute zero, the atomic gases are each separately in quantum degenerate states, which act as single quantum systems. ‘We then combine the atoms pairwise using magnetic fields and highly-controlled lasers to form the molecules,’ De Marco says. The scientists laboriously formed a few thousand molecules, finding their chemical reactivity to be surprisingly suppressed. ‘We have observed, for the first time, quantum degeneracy directly affecting chemical reactions,’ underlines De Marco. The KRb molecules react at as little as a quarter of the speed of their non-degenerate counterparts. ‘This observation is at odds with classical intuition, and it can only be explained via quantum effects,’ De Marco adds. Giving molecules quantum degeneracy involves co-ordinating their motion such that every molecule exists at the same rotational and vibrational energy level. But there’s more to the state, De Marco explains, because molecules move extremely slowly at ultralow temperatures. That means that they behave less like particles and more like waves. As these waves overlap ‘it becomes physically impossible to tell the molecules apart, and a new, collective degenerate state emerges’, De Marco explains. Ye adds that this means that a single reaction must involve multiple molecules. 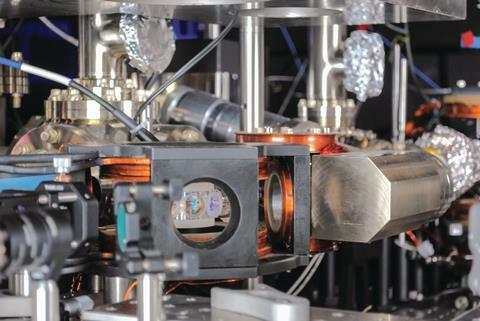 Understanding how ultracold quantum degenerate molecules behave chemically is a cutting edge area, where De Marco, Ye and others are exploring fundamental principles. One obvious potential consequence could be new chemical control methods. 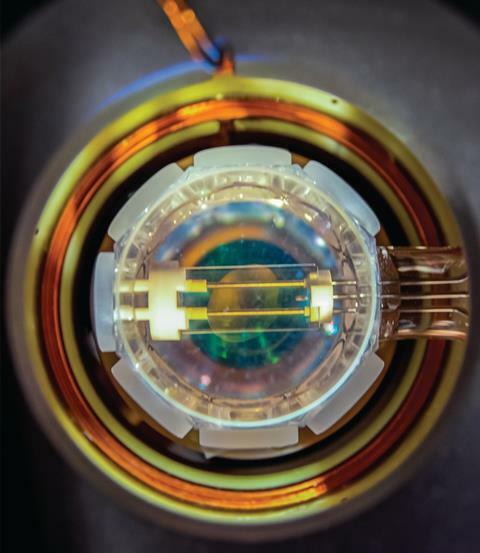 ‘But it’s increasingly likely that there are real applications on the horizon,’ De Marco adds, which might include quantum information storage or precision measurement tools.